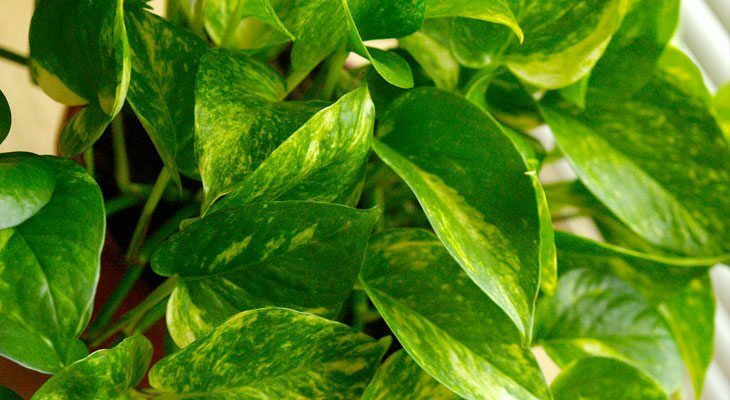 Golden pothos is one of the most popular houseplants in the world because it is so easy to care for. 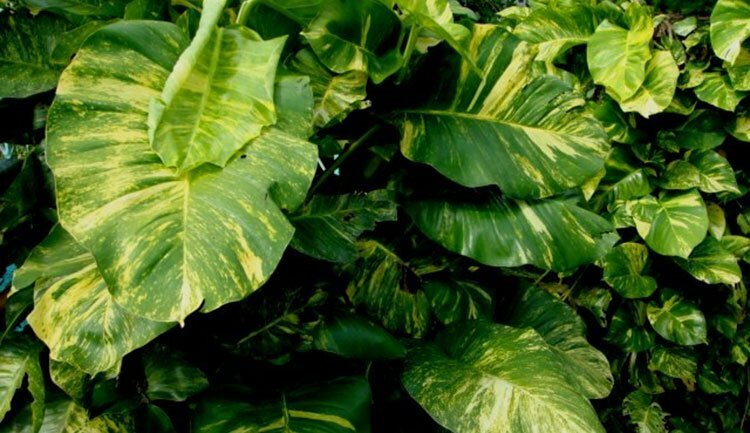 It’s a gorgeous vining plant with heart-shaped leaves that are variegated in green and yellow. It’s a fast grower, hardy, and can tolerate a wide variety of growing conditions. The vines can reach 10′ or longer, making them ideal for hanging baskets where they will create beautiful draping foliage. If a moss pole or other type of support is provided, the devil’s ivy plant will create a beautiful climbing houseplant. Devil’s ivy care is pretty straightforward. It takes the name devil’s ivy simply because it’s hard to kill and is actually an invasive species if grown outdoors in many regions. An excellent beginner plant, it’s not fussy at all and can thrive in both bright sunlight or dim lighting inside your home. The only lighting conditions it can’t tolerate are full, direct sun and complete darkness. The root system of pothos plants is rather shallow, so you only need to water a little bit to penetrate the roots. Water it as often as needed during the growing months of spring and summer. Just avoid soaking the soil completely and you should be fine. As far as soil goes, a standard houseplant potting mix is perfectly fine. It should be well-draining, but hold on to enough water to remain moist in between watering (devil’s ivy doesn’t like super dry soil). Golden pothos is quite hardy and can survive without fertilizer for months on end. However, if you want to produce vigorous growth and foliage, give it a 20-20-20 mix. If the plant stops producing new growth, reduce the frequency of fertilizing to once every two or three months. Pothos does well in a smaller pot, so feel free to keep it in the pot you buy it in for quite some time. I have had mine in a 6″ pot I bought at the nursery for over half a year and it’s doing just fine! However you can repot it if you want more vigorous growth. Just add extra soil and pick a pot 1-3″ larger than the existing pot. You don’t need to be extremely careful when repotting because the plant is so hardy. You should prune your plant to control its shape over the year. Sometimes it will send out vines that look a bit bare except for foliage at the very bottom, so pruning those back will make your plant more aesthetically pleasing. Along with being easy to care for, golden pothos is also one of the easiest houseplants to propagate! You can simply clip the vines and root golden pothos in water. New roots will form at leaf nodes, which are directly under a leaf. When you make your cutting, remove the lowest leaves and place the cuttings in water. You can also propagate by air layering, but most gardeners use the water method because of how quickly the cuttings form new roots. Golden Pothos doesn’t have many pest or disease problems. Like I’ve mentioned, it’s hard to actually kill this plant, even if you try. There aren’t a lot of mistakes you can make that will harm the plant. Although the plant is susceptible to several pests, infestations are rare. Fungal and bacterial problems are the main cause of failure with this houseplant. These problems which cause root rot and leaf spots can be avoided by making sure the soil is only moist and not soaked. Pests include spider mites and mealy bugs, but mealy bugs are most common. They can easily be removed by using a cotton swab dipped in rubbing alcohol or an insecticidal soap. Q. My golden pothos plant is growing like crazy and I don’t know what to do with all of the vines – help! A. When you cut off parts of a pothos vine, typically new vines grow right out of the cut. Sometimes you’ll even get two new vines, just like the heads of a hydra. To prune down a crazy pothos plant, you should either wrap the vines so they’re more manageable, or cut some completely back to the soil surface. Q. Why are the leaves on the bottom of my pothos turning yellow? Q. What should I water my pothos plant with? Tap water, distilled…? A. Unlike some houseplants, golden pothos is fine with normal tap water. You may want to let it cool to room temperature though to avoid shocking the root system with a sudden temperature change. Q. What is the best pruning strategy for devil’s ivy plant? A. If you don’t prune it at all, it will become a vining plant and drop a lot of foliage and vines all over the place. If you want to control it, all you need to do is cut off a vine completely to thin it out. You can also root these cuttings if you want even more golden pothos! My cat tries to eat most plants. He has even become ill at times. What reaction would he have if he tried to eat “Devil’s Ivy”? Thank you. Golden pothos contains natural crystalline formations in its sap which are called insoluble calcium oxalates. These are considered toxic to cats and dogs, and will cause intense burning and irritation in the mouth as well as on the tongue and lips. The cat may experience excessive drooling or vomiting, and may have difficulty swallowing due to swelling of the mouth and throat. I would recommend you keep the Devil’s Ivy away from your cat to be on the safe side! Thanks for the great post! Will a couple of hours of direct sun (about 1.5 meters away from a southwest facing window) be bad for the plant? I had it in a shadier corner but it lost all its variegation so i presume it must need a little sun but don’t want to irreversibly damage it! Thanks for any help!!!! I’d split the difference, I’ve noticed that it can TOLERATE full shade or full sun, but it doesn’t like it. That sweet spot of bright, indirect light is where it’s at. A standard houseplant fertilizer at 50% dilution will work! I have a Devi’s ivy plant. It is almost 23 years old. We recently repotted it and while doing that we measured the vines. One vine alone was 30 feet long and 5 others nearly 20 feet. I do not trim it. I repot it about every decade. Wow, incredible to have a specimen that old! Well you think it can’t be killed, but I do it every time. I got this beautiful huge plant and now it’s merely one vine what did I do wrong I water it , have in a well lit place still it want grow HELP!¡!!!!!! Hahaha, it’s not invincible Linda! Make sure you are checking moisture levels and the soil quality is good. You can definitely kill it by over / under watering. You may have to manually train them! I love Pothos. I occasionally spend a half-hour at night fussing around with my plant, then come back in the morning to find what LOOKS like insect damage to a leaf or two, or three. It just looks as if something is just nibbling away at the edges of the leave…close to the tip of the leaf. I have searched through a magnifying glass to find the little bugger, but cannot. Can you or anybody else tell me what is going on? I’d have to see a picture to know for sure. Could be a watering / fertilizer issue though if it’s just at the tips? Hello. I reported my pothos and now the leaves are turning brown. What should I do? I did use a much larger pot than what it was originally in however. Usually you want to use a pot only 1″ bigger. It might be an issue with the soil mix you used…I’d try to mimic whatever mix the pothos was growing in before you repotted. Also check for watering issues. One thing I’m curious about is I’ve seen people grow this plant in nothing but a glass bottle with water and no soil. I’ve also heard this plant does fairly well in hydroponics. Is there a specific way this needs to be done or should it just be avoided for a healthier plant? Yes, you CAN do it this way but it’ll need some fertilizer for sure if you do it in only water. It’ll simply do better in soil though, and with far less maintenance! My photos is growing pretty well, I placed it in a hanging basket for the first months after I bought it. It was growing really well so I figured there was no need to check on it! When ai eventually took it off the wall for an inspection, I found out that the whole soil surface was covered by a grey-fuzzy mold. I repotted it straight away, cleaned the roots, which looked healthy and kept a close eye on it. It is still growing well but I recently noticed that mold is coming back, what am I doing wrong? What can I do? I really like this plant and I wouldn’t like to lose it! Mold usually thrives on a particular set of environmental conditions – moist air, relatively warm temperatures, and moist soil. I might try seeing if your pothos is in a location that fits those and moving it out and experimenting with watering less! I’ve had my golden pothos for a couple weeks now and the vines are growing straight up. I would like the vines to drape down the side of the plant. Does it just need to grow more? Yes, needs gravity to work on it once it gets longer so it droops! I had a devils ivy that had vines about 4 metres lon so i cut it and started to propogate it in water and it grew a healthy set of roots in the water over about a month. I have just planted it in some potting mix but now its looking a little wilted and some of the leaves are turning yellow. I don’t want to over or under water it so i am not really sure what to do? Often times when you transplant a cutting into the soil it’ll have a tough time getting established. Make sure you didn’t take too long of a cutting…too many leaves can make it harder to establish. I trimmed one of my vines about a week ago, now the end of the vine where I cut it is looking sort of brown, with no new growth yet. I cut it about an inch away from the nearest leaf, should I have trimmed it closer to the leaf? Should I re-cut it now or will it eventually start to grow again? As long as you didn’t cut off the nub below the leaf that’s still on the stem, it will start to grow again! Just takes a while. My pothos definitely has caught some sort of disease – the leaves are developing brown networks of spots, cracks/holes in some, and browning and shriveling up around the edges. Is this bacterial/fungal? Can I save my plant? How did this happen in the first place?? 🙁 it was growing so much and I finally had beautiful vines and then went downhill so quickly. Someone please help, this is my first plant ever! Nooo! Sorry to hear this Karly. Neem oil is a good idea, you can see my article on that here: https://www.epicgardening.com/neem-oil – it may not be able to be saved, but fortunately pothos are relatively easy to find and you can replace. Make sure it’s not a soil or water issue first! Can I repot my plant in the winter. I’d wait until late winter or early spring so the plant is ready to grow into its new pot! Thank you for such clear, comprehensive information! Yup, great suggestion Brian. Nothing below 45°F indeed! Hi my lithos has some vines that are first turning yellow and then shrivelling up and dying. What could be causing this and is it likely to kill the entire plant? It’s likely a fertility or watering issue, I don’t think either would kill the whole plant if it was treated sooner rather than later! I’ve been having a problem with my devil’s ivy I’ve never encountered before. There are many brown skinny pea type formations growing on the vines. They are unsightly so I trimmed them all off but they periodically come back and I have no idea what it could be or even how to accurately describe them. Any suggestions on how to fix this problem or what it is? That is actually normal for pothos Connie, they are called aerial roots. The plant is able to put out roots from parts of the stem (works as a propagation technique too). No need to trim! My question is,if you wipe the pothos plant leaves with alcohol does it really work or does it hurt the plant. Hello all, has anyone started their pothos from seeds? If so, where did you buy them? My pothos ivy is about 5 years old and grows outside. It now has leaves that are about 12 inches wide and its stalk is about 1 inch wide. Further the stalk has some serious heavy duty anchors that are attached to the wooden fence. A couple of years ago it vine’d/grew horizontally and i was able to guide its direction. But it froze during the a bad winter. Subsequently, the ivy sprouted again but only after the 2nd year, ie this year, had the leaves become giant size again. The problem i have is that its growing vertically and its destination is not a good place. Its about 10 feet high now. My question is can the anchors be severed in order to release its grasp on the wooden fence? What i would like to do is to take a exacto knife and carefully severe the anchors and then carefully bend the stalk with breaking it and breaking the beautiful leaves- guiding it horizontally again. I just bought this plant. It was in a 4 inch pot, and it had many different stems and leaves and looked like the pot was not large enough. I transplanted it, using the same soil I used to transplant other plants. I drowned my plant because I was taught after switching containers you need to water the plant very well. The water has drained out and it’s all good there. I don’t have many places to put the plant, I decided on a south window which gets sunlight coming in at an angle. The only problem is my room gets cold. It’s turning winter and my room has already gotten 64 degrees. I will try and get a small heater, but my room is still very cold. Will my plant be okay? It’s in a larger pot, in good sunlight, etc. Its just the coldness I’m worried about. Hi I have the same plant and I transplanted them. They go into shock for a little while. If you watered them don’t water them for a good three weeks until their soil is dry. If you over water they may turn yellow telling you they have been over watered. Good luck! Hi, I have a devils ivy and I’ve had it since June 2011. I just recently changed the pot it was originally in. Now It’s acting wierd. I thought it was going to get better but its creating brown spots on the yellow not healthy looking leaves. I cut the dead leaves off, but it just seems that after I do that, more leaves with yellow and brown spots keep coming back. Can you please help me??? Too much exposure to light perhaps or maybe the soil is to acidic for the plant. Possible you could have overfed the plant with plant food? Try moving it into some neutral soil and give it some time to adapt before adding anything into the other than water.